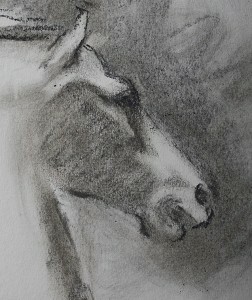 This post is the first of a short series on “how to draw horse eyes”. 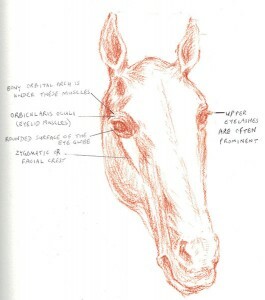 Instead of giving you step-by-step instructions on copying a horse eye, I shall provide plenty of tips and ideas that you can apply to your own horse drawings. 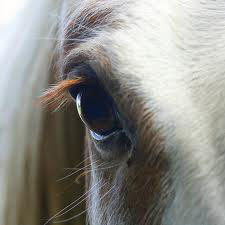 The first thing to get right when drawing a horse’s eye is to position it correctly on the head. However adept you are at getting the eye detail correct, the picture will not look convincing if the eye is poorly positioned. Today I discuss the basics of eye shape and position. In part 2, I shall explain the close-up view of the eye and lids in more detail. 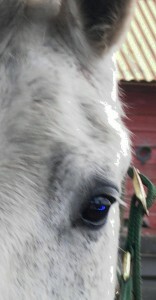 In part 3, I shall discuss horse eye expression. 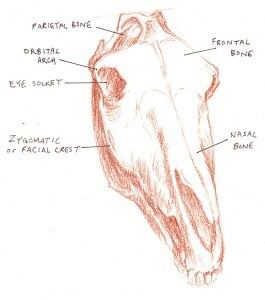 Note, in the diagram above, the rather rounded eye socket (hole) . The eye fits into this socket. See how the bony rim around the eye socket juts out more above the eye than below it. This can throw the eye itself into shadow in many lighting conditions. Notice how the “orbital arch” juts out to the side of the head. 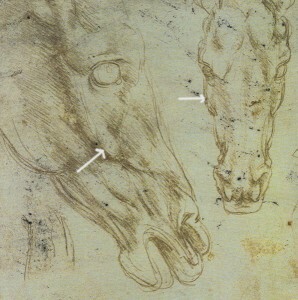 In fact, this orbital arch (the further-back part of the bony rim of the orbit) is usually the widest point of the horse’s head. The eyelids form an almond-shaped opening for the eye. 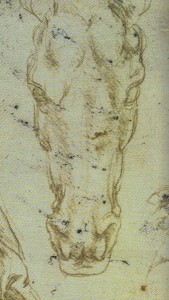 That almond shape is angled in relation to the horse’s head. The furthest-back part of the eye juts out to the side. And here is an almost- frontal photo of a horse head. Again, the slant of the eye from out to in is apparent. Also notice how the upper eyelid juts out to some extent and overhangs the eye. The upper eyelashes are very prominent and really overhang the eye. The lower lid does not jut out to the side. What structures surround the eye? The muscles above the eye form an upside-down V or C-shaped “eyebrow”. The shape of this brow changes with expression and mood, and I shall discuss that further in part 3 of this series within the next few weeks. In the above photo, I have marked the eyebrow with a red arrow. The temporal fossa is marked with a blue arrow. This is a hollow depression above and behind the eye. It is more hollow in some breeds including Arabian horses, and also in old or lean horses. The zygomatic arch is marked with a yellow arrow. This is a ridge of bone extending back from the eye. 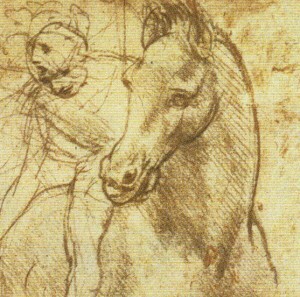 Here is another study by Leonardo da Vinci showing the position and slope of the eye in relation to other structures on the head. The position of the eye is very important. The eye itself is a round globe shape that domes out between the eyelids. The opening between the eyelids is shaped rather like an almond. 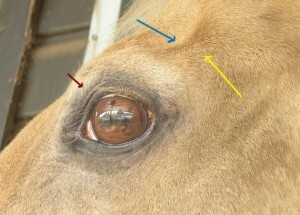 The eyelid opening is set at an angle. It slopes from out (further back) to in (further forward). The upper eyelid juts out much more than the lower lid. The eyebrow forms an upside-down C or V shape above the eye. Remember to check back here for the next two parts of this series on drawing horse eyes. I shall discuss the close-up appearance of the eye, lids, lashes, etc. in more detail next time. 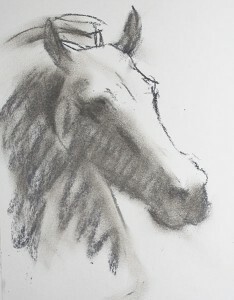 The third post will be on how eye appearance changes with horse expression.